As a Denver Foot Orthotics representative for ALINE insoles, we believe the ALINE system is the best foot orthotic to allow your body to perform at an optimum level and also reduces wear and tear on your body. Foot orthotics can be very helpful for a variety of foot ailments, including flat arches and foot and leg pain. They can cushion your feet, provide comfort and support your arches, but they can’t correct biomechanical foot problems or cure long-standing foot issues (no pun intended!). That is where Cherry Creek Spine and Sport provides added value as a local Denver foot orthotics representative. We correct any issues you have through chiropractic adjustments before we provide you with foot orthotics. This way your foot orthotics won’t be inadvertently perpetuating your foot problems, versus helping. You need to be balanced correctly before you start a foot orthotics program so that the orthotics help to support a correctly balanced body. ALINE’s patented foot orthotics technology revolutionizes insole design with a patented foot suspension system to include ribbed arches and contour zones. All of the elements work together to align your body from the waist down in order to decrease harmful forces on the feet, ankles and knees, and allow maximum performance. Suspension zones allow natural foot motion for alignment, balance and power. Ribbed arch technology compresses under the foot to reduce impact force and keep you aligned and supported for correct balance during activity. When you slow down and apply less force, the ribs rebound to gently lower your foot for continued support and enhanced alignment. Contour zones guide and stabilize your foot for control and support though its natural path of motion, aligning you from the waist down. 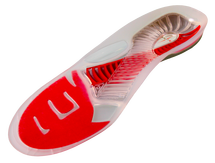 The ALINE red foot orthotic provides an added advantage. Thanks to its narrow and low profile, the red is a great choice for lower volume shoes and boots (including cycling shoes, cleat footwear, and low volume winter boots). The result is the most versatile high performance foot orthotic in the industry with tour patented alignment and biomechanical benefits. Traditional orthotics are hard and rigid all the way through the foot, not allowing the joints to do what they are naturally designed to do. Ideally, the first and fifth toes must be able to bend and move; otherwise you will be putting more stress on your joints and muscles. The ALINE foot orthotic helps your ankle, knee and hip all function as they were intended. Many Denver professional athletes have attested to the advantages of our foot orthotics offered through Cherry Creek Spine and Sport—please call us at (720) 974-0392 to discuss your needs.